Genocide is happening. There was a massacre this weekend. Innocent people are being slaughtered daily. Murder is not 'collateral damage.' And the world does nothing, except spin the reporting so that 112 dead Palestinians is a fair trade for 3 Israelis. So that bombs fall indiscriminately on homes, killing entire families in a moment. 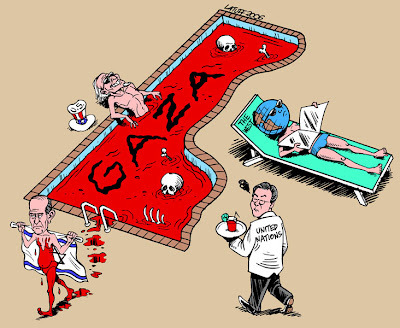 Widespread murder with impunity while the world decries rocket fire that has caused a few scratches. Men, women, and children dead at the hands of a brutal occupying army. The Israeli government promised a holocaust, and they're delivering. On Friday, 29 February 2008, Israel's deputy defense minister Matan Vilnai threatened Palestinians in Gaza with a "holocaust," telling Israeli Army Radio: "The more Qassam fire intensifies and the rockets reach a longer range, [the Palestinians] will bring upon themselves a bigger holocaust because we will use all our might to defend ourselves." This date will go down in history as the beginning of a new phase in the colonial conflict between Israel and the Palestinians, whereby a senior Israeli leader, a "leftist" for that matter, has publicly revealed the genocidal plans Israel is considering to implement against Palestinians under its military occupation, if they do not cease to resist its dictates. It will also mark the first time since World War II that any state has relentlessly -- and on live TV -- terrorized a civilian population with acts of slow, or low-intensity, genocide, with one of its senior government officials overtly inciting to a full-blown "holocaust," while the world stood by, watching in utter apathy, or in glee, as in the case of leading western leaders. For an Israeli leader who is Jewish, in particular, to threaten anyone with holocaust is a sad irony of history. Are victims of unspeakable crimes invariably doomed to turn into appalling criminals? Abused children often grow up to, in turn, abuse their own children. The offspring of racists usually become racists themselves. From this terrible cycle there seem to be few ways out. Whereas abuse victims can seek help from psychotherapy and support groups, the case of nation-states is somewhat different. Help needs to come from external forces, such as international involvement (perhaps in the form of boycotts, divestment, and sanctions) and worldwide condemnation. Alas, news reports on what is actually happening are hard to find. Yesterday, browsing the websites of CNN, BBC, and MSNBC one would have had to delve a bit to find any mention of the current situation in Gaza. And even when an article could be located, the headline often betrayed an Israeli bias. Article titles often mentioned the Israeli "anti-rocket offensive" and the Palestinian "suspension of peace talks." We are supposed to believe that a victimized Israel is forced to kill civilians in a noble attempt to stop the evil Arabs from firing rockets at its innocent citizens. Israel's hands are tied, we are told. Civilian casualties are "the price of war," Israeli Defense Minister Ehud Barak says. The major media buries Palestinian death tolls while shouting that Abbas has halted peace talks - yet another way to blame Palestine for Israel's actions. "They're the ones that don't want peace," Israel seems to scream as they disregard the constant Hamas ceasefire offers and fire missiles into apartment buildings and wipes out entire families. And still, the focus remains on what the Palestinians are doing wrong. A BBC report today states that "neither the international appeals nor the Israeli crackdown stopped the barrage of rockets. More than 25 were launched on Sunday, and at least two more reached the city of Ashkelon on Monday after the Israeli withdrawal." Yes, you read that correctly, 25 Palestinian rockets fired at Israel is called a barrage, but a weekend when over 100 people lose their lives by bomb and gunfire is referred to as a "military operation" and a "campaign in response to the firing of rockets from Gaza." Israel killed more than four times the number of rockets that were fired by Palestine. They didn't kill four times the number of people (for each Israeli killed, Israel killed about 40 Gazans and injured hundreds more), mind you, they killed four times the number of rockets fired. I repeat: the Israeli Occupying Forces murdered about four people for each individual rocket fired at Sderot and Ashkelon. How's that for what the EU called a "disproportionate use of force" by Israel? The increase in violence started Wednesday when five members of the Qassam Brigades were killed in an Israeli airstrike in southern Gaza. Israeli military officials said that the squad had intended to carry out a special operation against Israel, possibly involving infiltrating the border and capturing a soldier. Militants in Gaza responded by firing barrages of rockets at Sderot, killing an Israeli civilian, the first such fatality in months. On Thursday they started launching longer-range, manufactured Katyusha-style rockets at Ashkelon, a city of 120,000 people about 10 miles north of the Gaza Strip. Israeli officials described the firing of the longer-range rockets as a serious escalation of the conflict, and they mounted a ground and air campaign in northern Gaza that left more than 60 Palestinians dead on Saturday. In Gaza City on Sunday, two more bodies were pulled out of a house that was bombed by the Israeli air force the day before, bringing the number of fatalities there to six. One member of the family was known to be a member of the Qassam Brigades. Ahed Atallah, a family member who was not in the house at the time, said that only he and a married sister had survived. Late Sunday afternoon, militants fired two more missiles into Ashkelon, one of which damaged a house, the police said. The residents escaped unharmed. Three hours earlier, Meram Levy, 30, a mother of two young children, was carrying shards of broken glass out of her apartment after a longer-range rocket had landed outside before dawn on Saturday, shattering all the windows. "At night I'm very scared," Ms. Levy said. She and her husband are now sleeping in shifts, she said, to listen out for the alert on the city's new public address system. The popular Ashkelon marina was also hit by a rocket on Saturday afternoon, lightly wounding two local residents. Pini Biton, who owns a restaurant at the marina, said the militants in Gaza had "crossed all the red lines." The outdoor cafes and bars there were empty at lunchtime Sunday, despite the fine weather. The fact that the rockets had reached Ashkelon made Israelis realize that "they can get anywhere," Mr. Biton said. Fourteen Israelis have been killed by the crude rockets since Palestinian resistance began firing them in 2001, while approximately 300 Palestinians were killed just in the few months since the renewed peace process was declared in Annapolis in November of last year. Nearly 5,000 Palestinian men, women and children have been killed since 2000, all "terrorists" in the eyes of Israeli intelligence chief Yuval Diskin. Though he may have passed on, the words of deceased Palestinian leader Yasser Arafat ring ever true thirty years since he uttered them: "Those who call us terrorists wish to prevent world public opinion from discovering the truth about us and from seeing the justice on our faces. They seek to hide the terrorism and tyranny of their acts, and our own posture of self-defense." As long as Israel is seen as a perpetual victim (by themselves and the rest of the world) rather than the actual pursuer and perpetrator of hostilities and genocide, there will be no justice. And in the place of justice, there will be only death. Even yesterday evening, after the IDF already had killed about 50 Palestinians, at least half of them unarmed, and including quite a number of women and children, Jerusalem continued to claim, “At present there will be no major ground operation.” It’s incredible: The IDF penetrates the heart of a crowded refugee camp, kills in a terrifyingly wholesale manner, with horrible bloodshed, and Israel continues to disseminate the lie of restraint. Two days earlier Israel killed more Palestinians than have been killed by all the Qassams over the past seven years. Among the dead were four children and an infant. The next day Israel killed another five boys. And who is the victim? Israel. And who is cruel? The Palestinians. This victimhood is not new, nor is our self-deception. The current lie: ‘restraint.’ Israel is demonstrating ‘restraint’ in the face of the Qassams; this assertion continues to spur the commentators and security experts to urge it to embark on the anticipated ‘major operation.’ But this operation began long ago. It reached its peak yesterday. Our desperate attempt to have our cake and eat it, too, to claim that there is no ‘major operation’ at a time when the IDF is killing dozens every day, is nothing new. It has existed since the days of the ‘enlightened occupation’ and ‘purity of arms,’ through ‘the major operation that has yet to begin’ - all of them impossible desires. A senior minister who was asked last week about the siege on Gaza replied: ‘Occupation of Gaza is less moral.’ In this way, we have once again established ourselves a relative and distorted values system, with no absolute morality, only a double standard. Behind every action of ours in Gaza, even the terrible one this weekend, hides an option that is even worse. The fact that we are not yet carrying it out helps us to present ourselves in a positive light, to boast how moral we are. During the past two years, we have killed almost 900 Gaza residents. About half of them were people who did not take part in the fighting. That is how restraint looks. At a time when we are counting the Qassams and their victims, in Gaza they are counting the dead. Presenting things as though we have not yet entered Gaza or “beaten the hell out of Gaza” is meant to deceive. Yes, more can be done. Imagine if the Palestinians were to kill dozens of Israelis, including women and children, in one week, as the IDF did. What an international outcry we would raise, and justifiably. Only in our own eyes can we still adhere to our restrained, forbearing image. All the talk about the ‘major operation’ is designed to achieve only one goal: to show it is possible to be even more violent and cruel. That is an extremely pathetic consolation. The siege, the assassinations and the raid this weekend are terrifying enough. The claim that as opposed to them, we do not intend to kill children and citizens, is also overused and deceptive. The gun sights of Israeli weaponry are sophisticated. If the Palestinians had Apache helicopters and sophisticated drones like ours, we can assume that they would choose more strategic targets than the yard of a hospital in Ashkelon or a parking lot in Sderot. The Qassam is the weapon of the poor and helpless. In the South, a war of attrition is taking place between the strong and the weak. It will not be stopped by military means. It is therefore surprising and depressing to see the uniform chorus of the residents of the Western Negev, city dwellers and kibbutzniks, the direct victims, in favor of the IDF’s pointless fighting. How is it that in the entire South, not a single different voice can be heard, calling for a change in direction? How is it that no group of Sderot residents, yes, they of all people, is shouting in protest? Demonstrating in the city squares, not in favor of more of the same, but in favor of a different, much more promising approach? After all, they are the ones who are paying the heavy price, and they should be the first to see what the residents of the center of the country cannot see.? The residents of Sderot, and now Ashkelon as well, have to look and see beyond the fence that is meant to protect them, and is imprisoning their neighbors. To understand that as long as things are so bad there, things will be bitter for them as well. That as long as we don’t talk to them, nothing will change. They, who know that every assassination is followed by the ‘Color Red’ Qassam alert, fear and anxiety, who know that dozens of assassinations have not improved their lives at all, that the present raid will not help either, should be the pioneers who bring about the change we need? A large operation is now at its height. It has not helped at all so far; it will never help. Neither will the siege, the assassinations, the raids or the bombings. Perhaps the good will originate from the South, and someone there will call for something else?